Following is the shortlist of my heroes who have laid down some of the greatest lines ever drawn in history. I encourage you to be diligent in studying these Great Lions of Drawing. Let’s dive in! 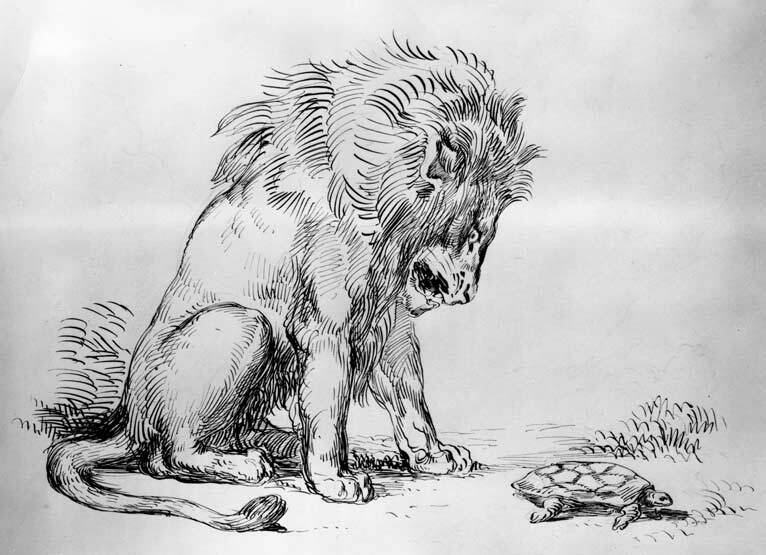 Master drawers simply have a knack for placing all the right lines in all the right places, as shown above in Delacroix’s lion and turtle sketch. Of course, to achieve this level of skill, the masters practiced drawing and painting most of their waking moments in life. At first glance you’ll notice the wizardry of each master’s techniques, such as harsh strokes transitioning to delicate curves, or chaotic scratches blending to rhythmic patterns. Looking closer, you’ll begin to see their different strategies in unifying lines into shapes; then modeling shapes into convincing, realistic form. In a style that appears to have been created just last week, this Paleolithic drawing shows how masterfully drawn contour lines can depict realistic form. Even after 300 centuries, these nuzzling lions symbolize our enduring desire for using lines to record the world around us. 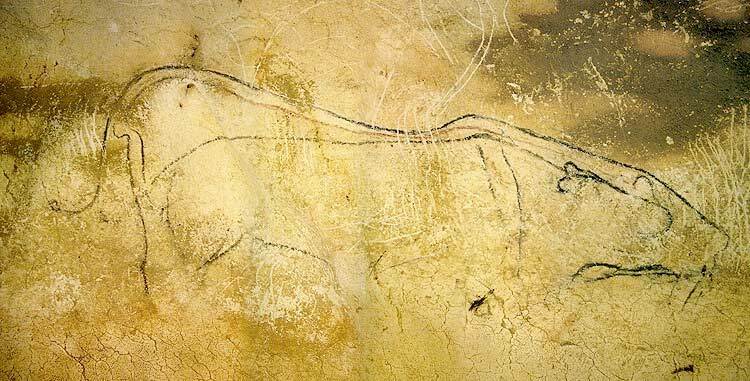 This astonishing Chauvet Cave drawing is featured in The Cave of Forgotten Dreams. German engraver and painter, Albrecht Durer was a preeminent line meister. He handled the seemingly impossible task of depicting the lion’s mane by suggesting its furry mass with sparse flourishes of curved lines. 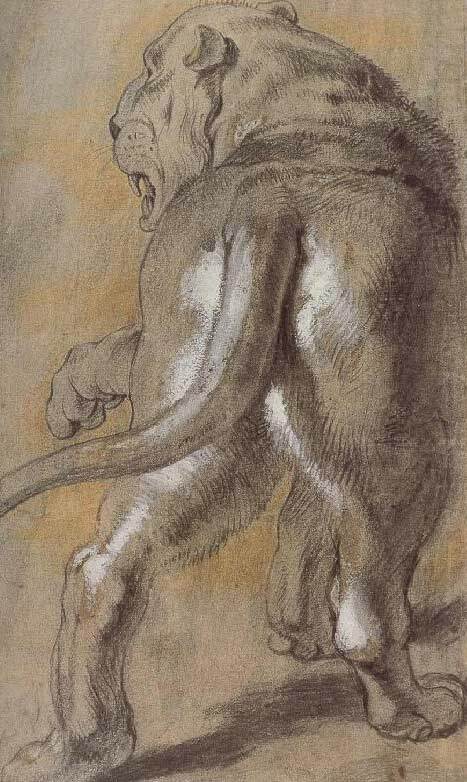 Durer was a pioneer in using extensive line work to depict 3D form, as shown in his confident delineation of textured fur covering muscles. 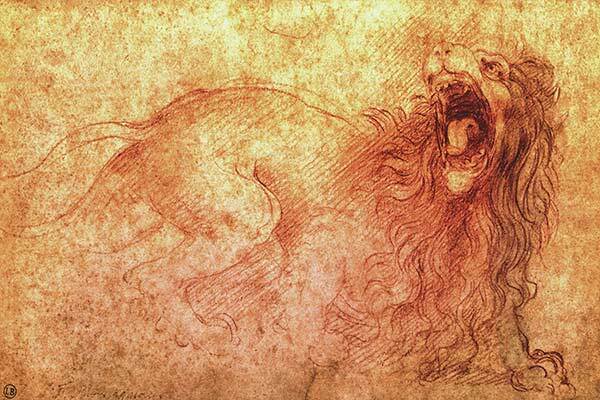 Being the Renaissance man that he was, Leonardo da Vinci’s inventive genius and extensive knowledge of anatomy is made visible in this iconic study sketch. 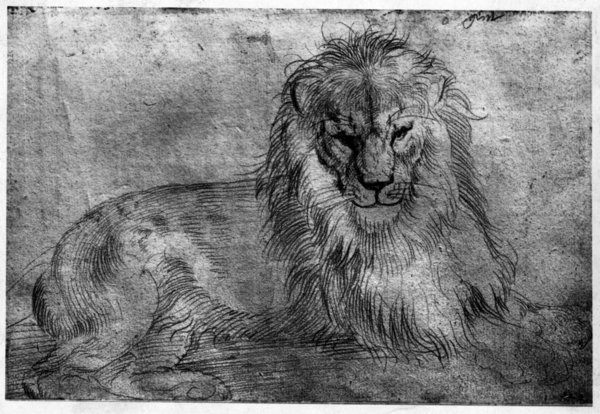 Rapidly drawn patterns of angled lines and dauntless, flowing contour lines emphasize the lion’s mane and movement of the jaw. The rage during the Flemish Baroque era was an extravagant painting style that emphasized movement and sensuality. 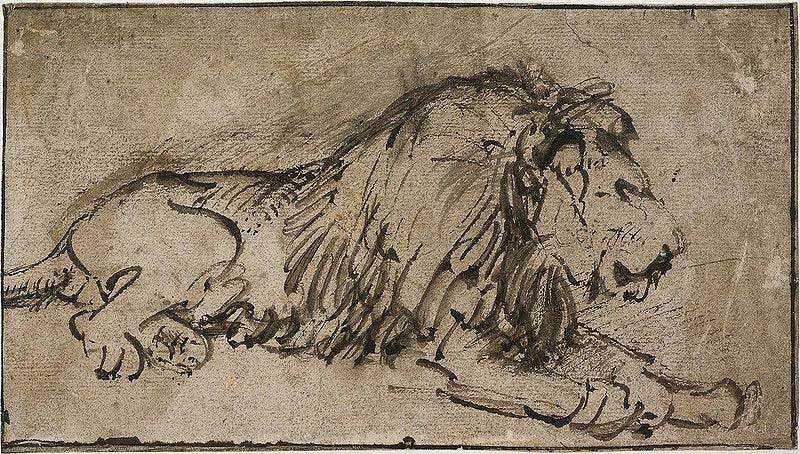 This preparatory drawing for Daniel in the Lion’s Den showcases Sir Peter Paul Rubens’ expertise in modelling muscle mass and textures that distinguished him as the consummate draftsman. The dutch painter, Rembrandt van Rijn, was adroit with all drawing media. These ink studies show his mastery of rapid line work. Rembrandt’s brilliance is not so much what he shows us, but what he doesn’t show. 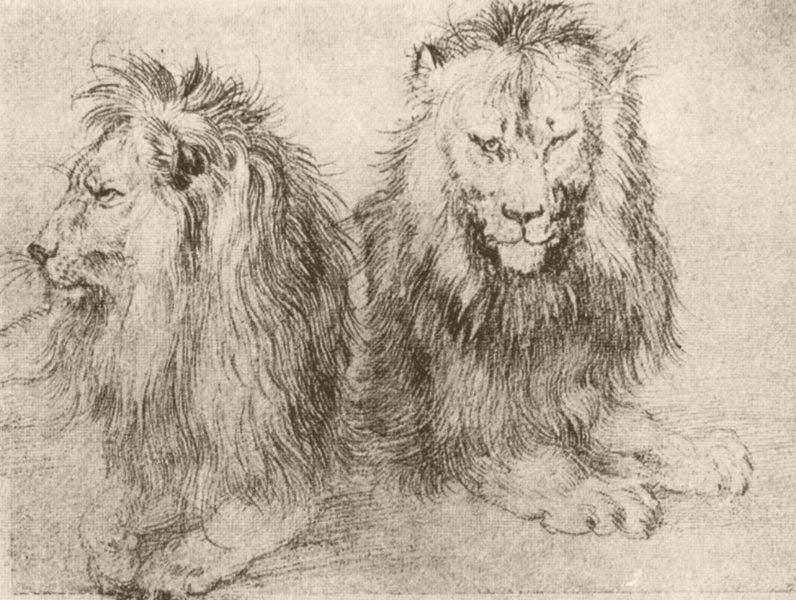 Meandering, broken lines suggest the clumpy masses of the lion’s mane overlaying smooth fur and muscles. 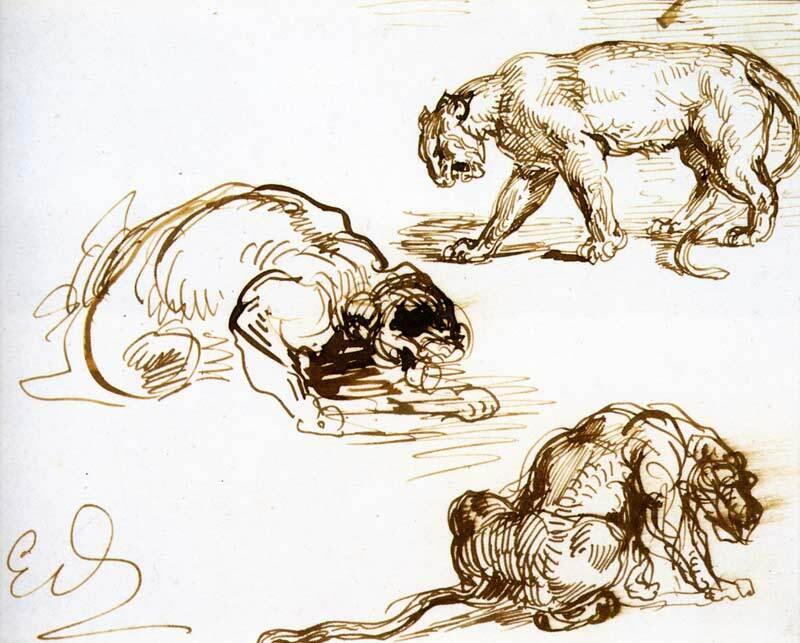 Ferdinand Victor Eugène Delacroix, acclaimed leader of the French Romantic school of painters, busted the sketching process open for all of us! His preoccupation with capturing tension, movement, and distribution of weight influenced generations of sketchers. It’s easy to see the fierce attention and speed of his drawing hand in his lion gesture studies. 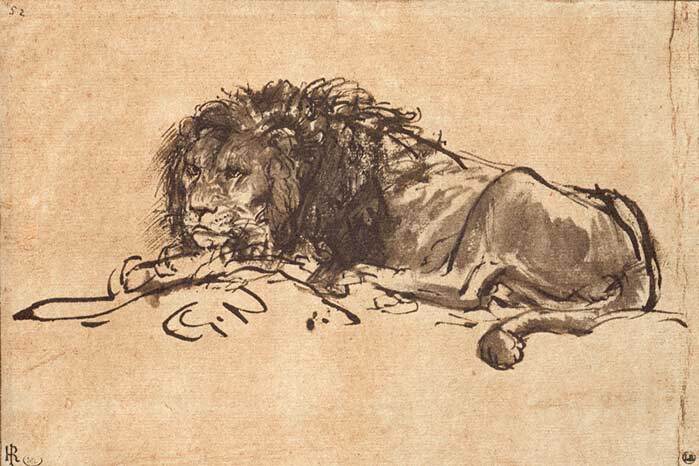 In studying drawings by the masters, we begin to understand what is needed to become accomplished sketchers: impassioned spirit, an alert eye, nimble wrist, lightning-quick hand, and impeccable line work—all foundational attributes that Great Lions of Drawing all share in common.